Playing It Safe: A Northwestern Law student and a recent grad — both former pros — weigh in on the NFL's legal obligations to protect its players and how athletes can advocate for their futures. Story by Anne Stein. Illustration by Daniel Hertzberg. A version of this article appears in the Fall 2017 issue of the Northwestern Law Reporter. It doesn’t take a math whiz to know that the chances of playing a sport in high school, then going on to play that same sport in college, and ultimately going pro, are incredibly slim. In fact, according to the NCAA, only about 6.8 percent of more than 1 million U.S. high school football players compete in college, and just 1.5 percent of those players go on to play in the NFL, which had 253 slots available in the 2016 draft. So what are the chances of playing professional football, retiring, then sitting in Professor Jules Crystal’s Labor Law class next to another retired player who once grabbed you by the face mask in a regular-season game? Tony Pashos and Quincy Black face off during the 2007 NFL season. 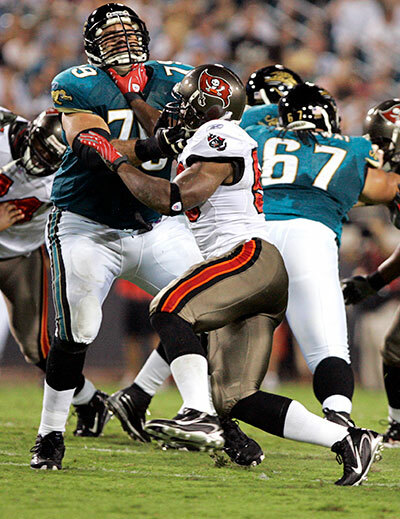 Drafted by Tampa Bay in 2007, Black played six seasons with the Buccaneers until a neck injury ended his career. Pashos, who lives in far south suburban Chicago, played an astounding 11 seasons after being drafted by the Baltimore Ravens in 2003. With the enormous number of pressing legal issues facing the NFL surrounding player safety, both Black and Pashos, who served as a player’s representative from 2009 to 2011, say their legal education has provided them with a more informed take on the NFL’s attempts to better protect its athletes. But it’s a tricky issue, and one that plenty in the football community —including NFL authorities, players’ representatives, and legal experts — have been grappling with for more than a decade. For starters, the game is both inherently violent and wildly popular in its current form. According to the most recent data available from The Harris Poll, football has been the most popular U.S. sport for three decades, leading number two-ranked baseball by 18 percentage points. And, from a financial perspective, it ain’t broke: according to the Sports Business Journal, the NFL expects to generate $14 billion in revenue in 2017. But football is a rough long-term deal for players, whose careers average about three years, mainly due to injury. (After Black’s second NFL season, the Chicago native started looking at law school programs to prepare for life after football.) A 2016 study, one of the largest to date on living NFL players, found that more than 40 percent of 40 retired pro football athletes, with an average age of 36, had signs of traumatic brain injury. And the 2016 NFL injury report, which was released by the league prior to the February 2017 Super Bowl, found that players suffered 244 concussions, 56 ACL tears and 143 MCL tears over pre- and regular-season practices and games. 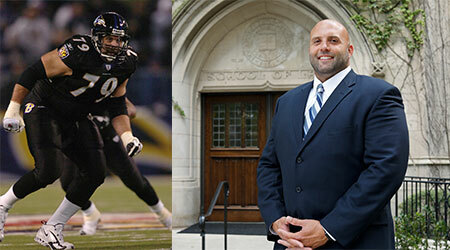 Left: Pashos played for the Baltimore Ravens for four of his 10 NFL seasons. Right: Pashos at the Law School. “The sport will be forever intertwined with pain and injury,” says Pashos. “You see the blood and noise and the hard hits and you celebrate the guy who gets back up.” The players, adds Black, “are so skilled and so fast and so strong that the game has become much more violent and as a result, more demanding physically.” Like the rest of America, NFL players have gotten bigger. In 1950, the median weight was 240 pounds for offensive tackles and 220 pounds for guards; in 2010, the median weight of both positions hit 310 pounds. On September 21, after this story went to press, researchers announced that former New England Patriot Aaron Hernandez had a severe case of CTE when he died in April, likening his brain damage to that of players in their 60s. The former tight end committed suicide in prison, where he was serving a life-without-parole sentence for murder. A lawyer for Hernandez's family said that his case of CTE was "the most severe case [researchers] had ever seen in someone of Aaron’s age." His lawyer also announced that Hernandez's family was filing a federal lawsuit against both the NFL and the Patriots. The clear link between hard hits and brain damage has led to a class action lawsuit and numerous NFL rule changes focused on reducing unprotected hits, especially to the head, and other violent collisions between players. These changes gained traction after Dr. Bennett Omalu, who in 2002 worked at the Allegheny County Coroner’s Office in Pittsburgh, autopsied the brain of 50-year-old former Steeler Mike Webster and found tau protein clumps similar to those of an elderly person with Alzheimer’s disease. Omalu came up with the CTE diagnosis, his findings were published in 2005 in the journal Neurosurgery, and the discussion of what should be done about CTE exploded. The highlights of the 2011 Collective Bargaining Agreement that Pashos and others supported included a longer off-season (leaving time for rest and recovery, and limiting pre-season practices), eliminating two-a-day practices, limiting full-on contact practices, and other efforts to eliminate, limit, or penalize more damaging and vicious hits. 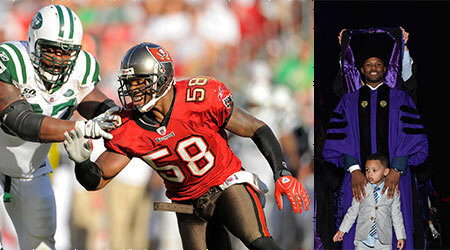 Left: Black was a linebacker for the Tampa Bay Buccaneers from 2007-2012. Right: Black and his son at graduation. Even with the improved protections for players, the nature of the sport makes injury hard to avoid — recall that 2017 injury report for proof. “I think the NFL is getting close to doing everything they can, but it’s still a physical sport and the probability of concussion is almost impossible to completely take away,” says Rick Smith (JD ’86) president of Chicago-based Priority Sports, and Pashos’s former agent. On the Ravens, Pashos explains, players went through carefully structured walk-throughs to learn game plans, giving them time to mentally and physically prepare, rather than immediately going full-speed. There were no wasted repetitions. Some practices the players went without pads, so there were no full-tackling takedowns. “The entire practice schedule is made for you to be at the top of your game and the best in the league,” he says. But it’s up to the teams to hire the Billicks of the football world; they can’t be completely written into a CBA. If a player does get better protection written into the rules and a coach who emphasizes player health, why would he still play hurt? Those reasons could range from the player’s own attitude toward the sport, to contract incentives, to the contracts themselves, which usually aren’t guaranteed, to the injured reserve system, which allows players to remain on the team but not take up a roster spot. Once an athlete is on the injured reserve list, in most instances he cannot play for the rest of the year. (An exception allows teams to bring back one injured reserve player each year after eight games, and for 2017 the rules add a second player to the list.) It can be a significant setback for a player, particularly if he has a strong chance of recovery before the end of the season, Gandert says. Missing an entire season can hurt bonus payouts and negatively affect future earnings, since players don’t have the opportunity to prove that they’re healthy. Plus, there’s a stigma on these athletes, who are often labeled “injury-prone” or considered a risky prospect for signing. Another contributing factor to the high injury rate is that the ability to withstand pain is not only admired in football, it’s expected. “All guys play hurt,” Black says. “I had the honor of playing with several players who were considered Iron Men. These guys never missed a game in 14 grueling NFL seasons and while I’m sure they had the incentive to play based on something in their contracts, the respect they’d garner from their peers is the overwhelming factor for them playing through injury.” When Pashos partially tore his hip flexor, he was “gung ho” to play until a trainer insisted he shouldn’t set foot on the field. But not every team, players say, will stop you in those situations; some will insist on protecting their players’ health, while others want and need you to play. The NFL’s concussion protocol is one response to the demand to better protect players. Independently certified doctors and athletic trainers who are unaffiliated with the team (and therefore have no incentive to encourage an injured player back into the game), are now stationed around the field. 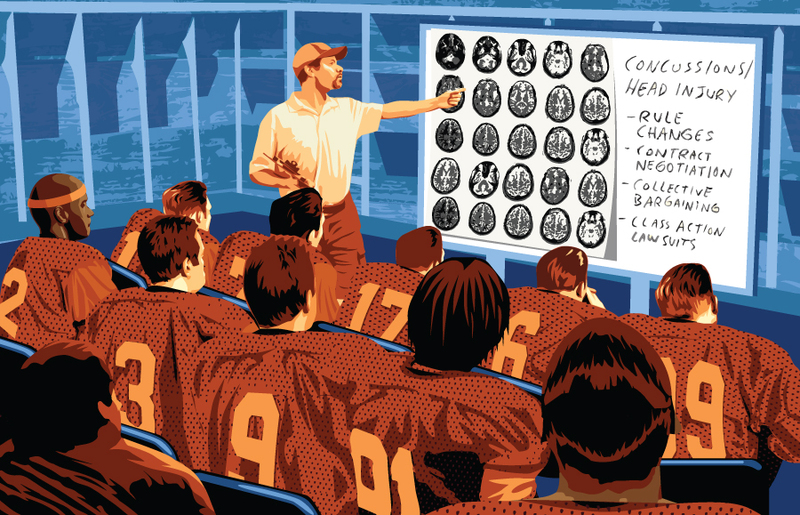 Players exhibiting concussion symptoms are supposed to be pulled from the game and evaluated with a series of questions and tests. And while players have admitted that they’ve fooled the tests because they want to get back on the field, it’s an improvement over the past, when players who insisted they could go back in after a hard hit were routinely encouraged to play. Pain and injuries aside, Pashos and Black both say that the years of blood, sweat and tears were worth every drop. “As a former player, I’ve been better able to handle law school,” Pashos says. For the first payout, $5 million was awarded to a retired player suffering from ALS. Additionally, $4 million went to the family of a deceased player diagnosed with CTE. The settlement covers NFL players who retired from pro football before July 7, 2014, and received a qualified diagnosis from an approved physician. It covers ALS, dementia, Parkinson’s and Alzheimer’s diseases. Players diagnosed with CTE between January 1, 2006 and April 22, 2015 (with an extension of 270 days to players who died between July 7, 2014 and April 22, 2015) can receive compensation, but since CTE is diagnosed after death, only families of deceased players can earn from the settlement.